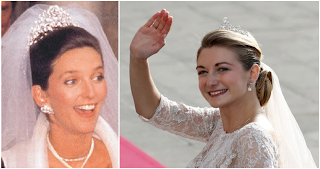 With not too much wedding news to report about, let's make some news of our own and have a look at the Luxembourgish wedding tiaras. That's right, not one wedding tiara but weddings tiaras. Over the years, the brides of the Grand Ducal Family have opted for very different pieces to adorn their heads on their wedding days. These tiaras are the obvious choices for Claire Lademacher to wear at her religious wedding ceremony on Saturday if she decides to wear a tiara at all. Sadly for us, quite a number of Grand Ducal brides chose not to wear any tiara at all. Nah, I don't even entertain the possibility that Claire will be wearing the Empire Tiara and neither should you. This sparkler was, however, worn by Grand Duchess Charlotte and Princess Hilda at their weddings to Prince Felix of Bourbon-Parma and Adolph, 10th Prince of Schwarzenberg respectively. 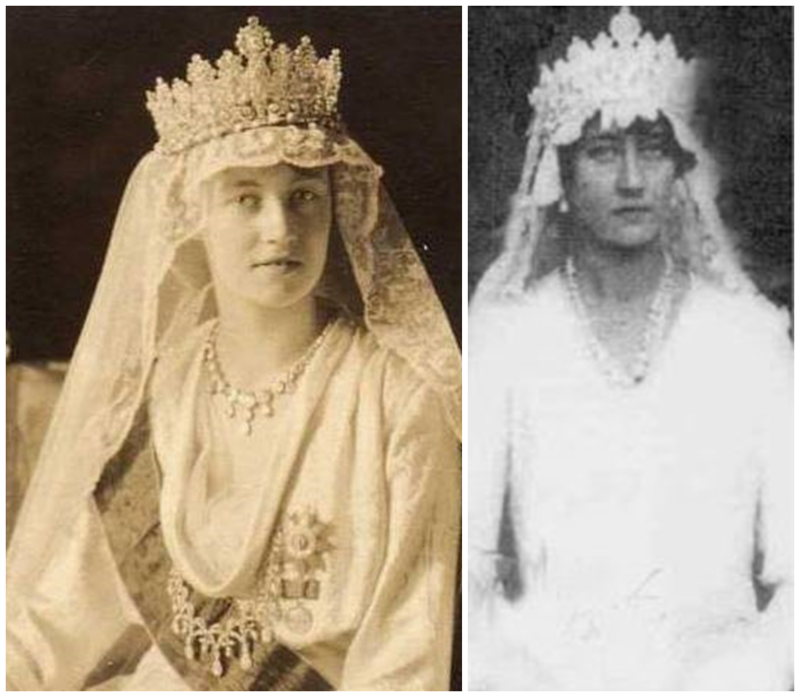 None of Charlotte and Hilda's sisters opted to wear a tiara on their big days. Moving onto the next generation of Luxembourgish brides in the form of Grand Duchess Charlotte's daughters. At her wedding to Antoine, 13th Prince of Ligne, Princess Alix was the first of the four sisters to wear the larger of the two floral tiaras of the Grand Ducal Collection. The has also been worn by Grand Duchess Maria Teresa and Hereditary Grand Duchess Stéphanie for various events. It was later also worn by Princess Marie-Gabrielle, Countess of Holstein-Ledreborg; Princess Elisabeth, Duchess of Hohenberg; and Princess Marie-Adelaide, Countess Henckel of Donnersmarck. Princess Joan did not wear a tiara at her wedding which happened on a much more private scale than any of the others. It was the other of Grand Duchess Charlotte's daughters-in-law who brought the Congo Diamond Necklace Tiara into the Family and also started a bit of a wedding tiara tradition with it. The daughter-in-law was, of course, no other than Grand Duchess Charlotte, a born Princess of Belgium. She wore this tiara for her actual wedding while changing into the Belgian Scroll Tiara later on. Her choice was echoed by her daughter-in-law Grand Duchess Maria Teresa as well as her daughters Princess Marie-Astrid and Princess Margaretha at their weddings. Neither Princess Sibilla nor the former Countess Hélène nor Countess Diane wore a tiara on their weddings. Not only the bigger one of the two floral tiaras has a history as a wedding tiara. The smaller one does, too. Two of the Habsburg brides of the family, Princess Marie-Astrid's daughter Marie-Christine and her daughter-in-law Adelaide, chose this sparkler for their big day. Archduchess Kathleen did not wear a tiara but a pearl headband. You remember what I just said about the Empire Tiara not being worn next Saturday? These tiaras won't be worn either but what the heck, who doesn't love looking at a few sparklers more?! Princess Charlotte wore the tiara her mother, the former Princess Joan. Yep, she might not have worn one at her wedding but she owned one herself. Hereditary Grand Duchess Stéphanie famously wore the tiara of her family for her wedding last year. I think the larger of the two floral tiaras would look beautiful on Claire. I can't wait to see her bridal ensemble!